Gas got expensive all of a sudden! 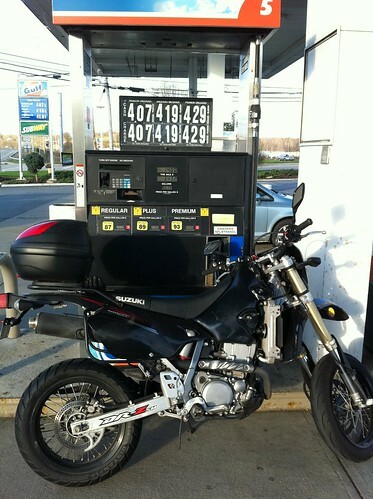 I will admit to feel a little bit of schadenfreude when I fill up the scrappy DRZ when gas is so expensive. 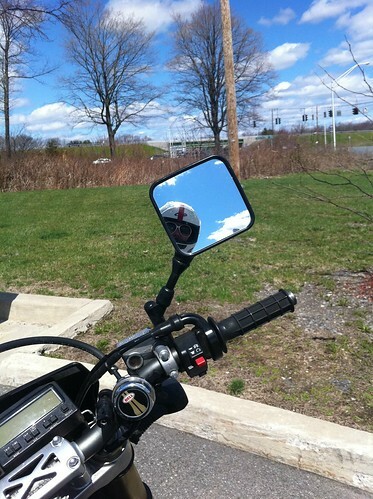 At 59 mpg I’m so happy I can commute by motorcycle… but I can’t help but wonder: how high WILL it get this summer? After sleeping nearly 12 hours straight and thanking our lucky stars we were out of the rain on Sat. night, on Sunday morning Mike and I headed out to meet friends for brunch. 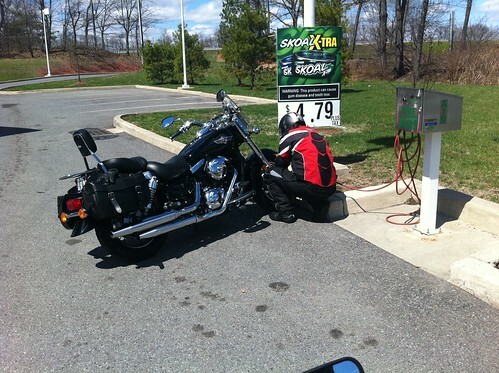 I was on my DRZ (natch) and he was on his 2007 Kawasaki Vulcan 1500 Classic – which he had to hose off before we left. Cruisers always look worse when they’re dirty than other motorcycles. it’s the fault of the CHROME. We also had to change the air in the tires before going too far. First day out and all that. it was a gorgeous day for a ride! 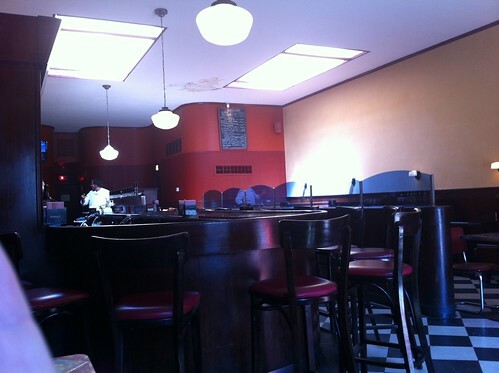 We planned to meet up with Michelle and Steve at the Birdsall House in Peekskill NY. We headed out across the Bear Mountain Bridge (of course I have no photos – I was riding!) and got there in good time. Michelle and Steve, on the other hand, were stuck in the parking lot that was the flooded Sawmill Parkway on their way up from Brooklyn. So we had to eat with out them. 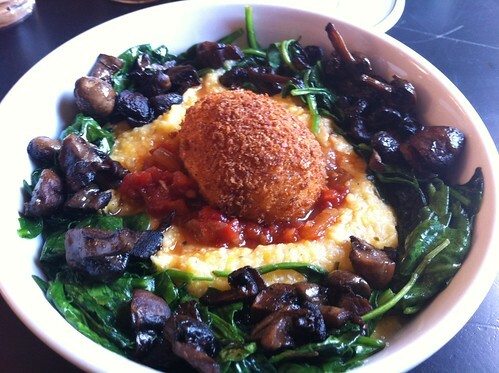 Delicious deep fried soft boiled egg over polenta, wilted spinach, and roasted mushrooms. 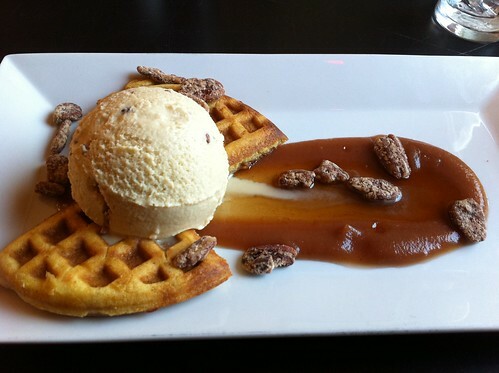 ZOMG maple bacon ice cream with apple butter and a cornmeal waffle. After we ate, we hopped (being a relative term which does not adequately describe the rolling motion required by our very full bellies) back on the bikes and headed down to Sleepy Hollow, where Michelle and Steve had stopped for their own Thai lunch. and then after chatting for a good long time we headed home. We took the direct route back when we got a glimpse of the imminent black cloudiness only to be rewarded by an icy cold super windy rain storm that may have included some hail. Mike was about to complain about how much the rain hurt his hands (it was that icy needles kind of rain for a bit) and then he remembered that I didn’t have a windshield and was being struck in the chest by these same horrible needles and bit his tongue. Of course my armored gloves kept my fingers from feeling anything horrible – an unexpected benefit from extreme safety gear. By the time we got home the rain had cleared up and we saw a rainbow! 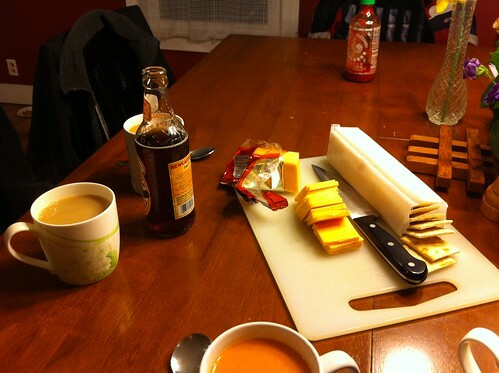 And we headed in for some hot milky tea, tomato soup, and cheese and crackers. The perfect dinner after our amazing and excessive lunch. Such a nice ride out. 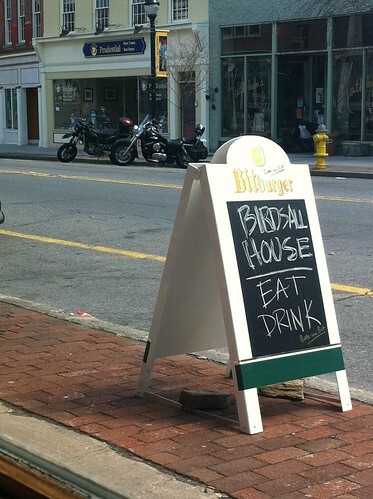 I can’t wait to go back to the Birdsall House – they cure their own meat! in house! and have a charcuterie plate! and use local farms for their food! Excitement! 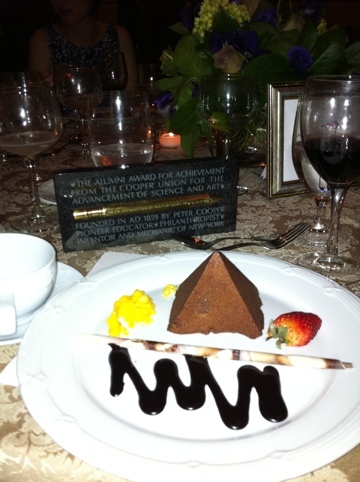 It’s a mouthful of a name, but I had such a great time at the dinner dance. And I was honored to be named Young Alumnus of the Year! Such a nice fancy time on my birthday. Y’all, I’m a semi-finalist for Greenest New Yorker. Clearly I have failed at social networking by not requesting that you vote for me already! It’s simple: go to this link, scroll down to the bottom, wait for the voting app to load, and vote for me. Me! unless there’s someone else you like better but really! me! It was really hard writing the brief bio. I only had 250 words, and there are so many things I left out. I hit the important stuff like Tiny Choices and motorcycling, but I didn’t talk about my professional chops as much as I could have. Here they are: civil engineering degree from Cooper Union, professionally licensed, hold my LEED AP, masters degree from CMU in environmental engineering and green design, and working in environmental consulting for over 10 years primarily on remediation sites. Active in sustainable remediation groups such as SURF. Co-author of a paper titled “Framework for Integrating Sustainability into Remediation Projects” slated for publication in Remediation Journal this summer. 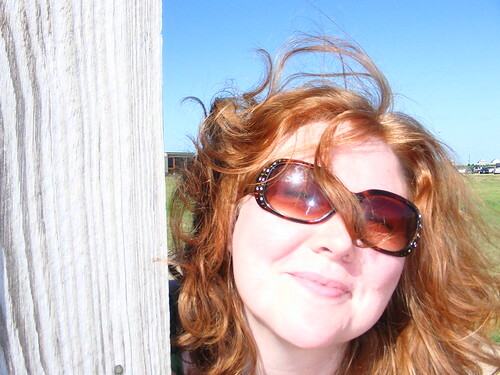 Office lead on company Green Team which is focused on reducing our local impacts on the environment. Seriously, yo: how could I fit all that into 250 words? I would love to be selected as “Greenest New Yorker” – I try hard to stay green! 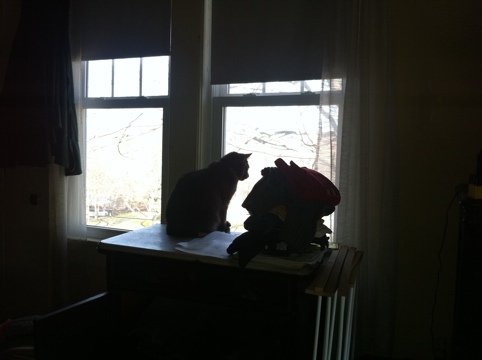 Every day I evaluate my choices and decisions to try and find easy ways to be more green. I write about these “tiny choices” on the blog I co-founded four years ago: TinyChoices.com. Most of my blog posts come from my personal life – I live in an old farmhouse with a long commute and understand the kinds of daily decisions most New Yorkers are faced with. We are making our home more efficient, and I ride a motorcycle and drive a hybrid for my commute. We vacation in New York – at least annually we have a fancy weekend date in a new part of the state, and more frequently we have fun family camping and hiking trips. Motorcycling taught me that my favorite kind of trip requires me to take a slower route that focuses on the ride, not the destination – and it’s changed the way I see much of New York State as I explore the backroads on two wheels. I’ve supported local CSAs (and learned to pickle), attended NYS craft and fiber festivals, and am endlessly fascinated by the name “central leatherstocking.” I write about many of my daily activities at www.karinajean.com. My day job is environmental engineering, where I clean up hazardous waste sites and perform sustainability analyses. I heart New York! and love the time I spend getting to know the state better. The (incredibly awesome and highly recommended) motorcycle forum I spend most time at has started an annual mileage competition – it’s all in good fun, so you post your mileage at the beginning of each year, and you get to see how far you’ve gone. 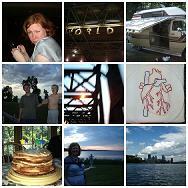 The first photo is from 4/4/10, and the second is from 4/10/11. 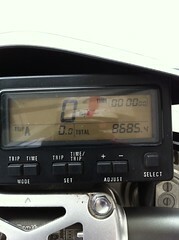 Amazingly I’ve put almost exactly 5,500 miles on the DRZ! and I say amazingly only because it’s such a nice round number. 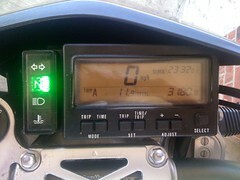 In all actuality, I would have put way more on but my poor bike didn’t turn on one sad morning in late July. I mean, it turned on fine… but it didn’t turn OVER. and I took it apart and did everything you’re supposed to do to the spark plugs and air filter and all kinds of things but couldn’t get the carb apart to clean it out, and it turns out that there was a PIN HOLE in the tube that goes between the petcock and the carb. so I don’t know if I’d have figured that out anyway. And THEN we were so busy through August and September and October and November (which was still pretty nice) that I missed out on probably about 25 at least ride-to-work days which would have given me an easy extra 2,500 miles. Oh well! this year will be massively better. for sure. Spring is in the air – temperatures are in the 50s and 60s this week! It was clearly time to get out the knee socks. Thank you, vaguely permissive work environment and fuzzy dress standards for female engineers, for facilitating this look. Our temporary kitty came out of hiding for some skritches today. Book is staying with us for 4 months while I Love To Do Dishes is traveling. He is sweet! 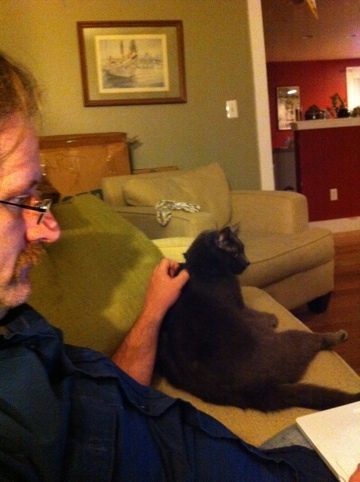 Mike is a kitty whisperer. Also of note: how excited Book was to see us, and how he cautiously looked for little boys before committing to the room. 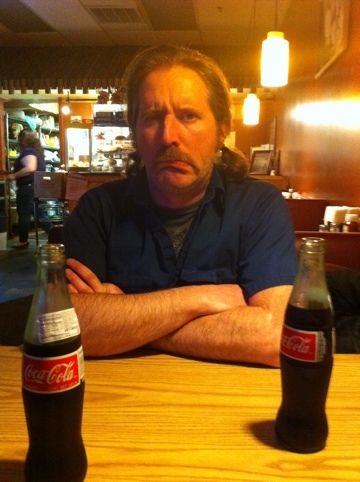 Despite his demeanor, Mike is actually quote happy to have discovered a new Mexican joint near our house. And look: Mexican cokes, with real sugar! UPDATE. This place is amazing. 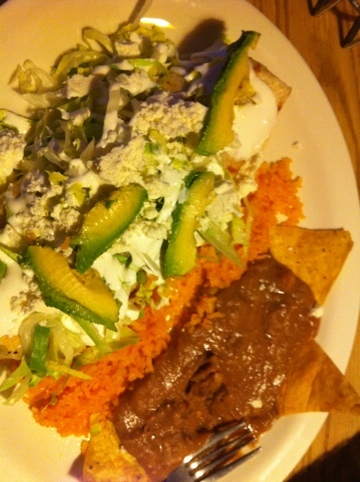 Not veg friendly – the beans are delicious and porky.